Real Name: Emily James Graveland. Known Aliases: Em, Emmie, Jamie. Place of Birth: Mercy Hospital, Millenium. Base of Operations: Millenium City. Maurice Morgan, Jade Morgan; God-Parent of Chloe Tallaghan. Physical Features: Deathly Crow’s Feet. Marital Status: Dating, In Committed Relationship. Masterful Ratiocination (Sherlockian School of Thought), Gun Training (Pistols and (Scoped) Rifles), 9 Styles of Martial Arts (Brazilian Capoeira, Ju-Jitsu, Judo, Karate, Kung-Fu (Shandong Praying Mantis), Muay Thai, Ninjutsu, Thai Kickboxing, Zui Quan), 3 Styles of Gun-Fu (Chinese Gun-Kata, French Bullet Ballet, Japanese Zen Riflery), Car-Fu. Two Luger Pistols, One Scoped Ruger Mini-14 Rifle. 2.2 "The Line In The Storm"
"Saying that Emily is a unique character would definitely be an over-statement. Although she keeps to herself, and only admits to working at a dry-cleaners' store that prides itself on its express delivery service, there's one thing that's blatantly obvious: she looks just like a regular girl." -- Emily's in-game description. Emily James Graveland (born February 1, 1994) is a member of the Neutral Services Union (NSU), working as the Assistant Manager for the union supported "Langley’s Dry Cleaners". She is also noted as one of the few survivors of “Redmond’s Disease” – a degenerative disease in which her body cannot maintain a magic aura to absorb and break down magical energies. Emily has also been recognized by the Department of Registered Combat for being the creator of the ‘Lead Mantis’ technique, which incorporates a number of existing martial arts, structured around Chinese Gun Kata, French Bullet Ballet and Japanese Zen Riflery. She has been at the centre of minor controversies regarding NSU policies and concerns over moral standings with NSU clientele. "I'm your dry cleaner. Probably." -- Emily, on who she is. Born to action cop superhero Arleen Morgan and stage magician David Graveland, Emily grew up in Central Millenium. She lived a sheltered life because of her disease. When she was 8, James Harmon Elementary School school came under attack by villainess Stormrise, who took Emily's class captive. Stormrise was shot and killed during the siege by a rookie cop under Arleen’s watch. Emily started going to Westside Highschool at the age of 13. One year later, in what became a large topic of controversy, she was suspected of burning Drew Larsby to death with supposed mutant powers. She was heckled and harassed by the other students, and at one stage, a criminal expert conducting research into teen-related assaults. A vigilante believed to be Drew’s father, Leland Larsby, kidnapped Emily four days after the murder. A task force lead by Arleen stormed the warehouse she was being held in, but Leland was not found. The real killer, school captain Thomas Moores confessed not long after. Emily was 15 when the Qularr invaded Millenium City. Not much is known about what happened to her during this time, other than her mother dying and her father escaping to a safe zone. It is believed that Emily had been cut off from her father at some point during the escape. Many survivors claim to have seen Emily rescuing other people, including her high school home group. In 2010, Emily applied and began working for the NSU as a dry-cleaner, where she quickly made a name for herself in both the heroic and villainous cultures. She was also involved in the “Service Anywhere” proposal, allowing NSU workers to enter and exit restricted areas prohibited by the government. The proposal passed in 2012. On August 9, 2013, Emily had registered her fists as lethal weapons. She had registered her “Lead Mantis” technique to the Department of Registered Combat, and was asked to instruct a Tactical Espionage team of mimics. She received a Service Medal and a recommendation from Field Officer Seth Swan. "The Line In The Storm"
"Don't deny it. It's only going to get worse from here." -- Captain Taneo. On February 19, 2014, David Graveland had been found dead by the back of Sherrera's Bar. Emily and then-journalist and girlfriend "Serenity Summers" were asked to identify his body. However, the wounds did not match the description of a suicide. The entry wound at an awkward angle to hold a pistol at and pull the trigger without spraining his right wrist; but his left wrist was the injured one. Emily spent the next couple days trying to match what could have happened. She decided to call Serenity and Robin Fenix to the White Dragon restaurant to discuss it in private. The building was stormed by Westside Avenger vigilantes in an attempt to kill her, but the three escaped. A couple days later, Emily and Serenity infiltrated the Avengers' territory and interrogated their leader, Dredwin. They found out she was targeted by an unnamed Private Military Company, but he had no reasons why. He also mentioned that the PMCs were controlling several other low-key gangs and where they operated. Fearing he had said too much, Dredwin asked them to fake his death so he could escape cleanly. Emily and Robin went to the Westside Docks, where the first gang, East Cartel, operated. They found and interrogated a member scouting the docks for any intruders. He told them a trade was going to take place between the PMCs and the Cartel. The PMCs were going to trade "Agent Cape" to the Cartel. Deciding he had the information they wanted, they rescued him. He told the two that several businessmen were paying the PMCs for protection, but one man, Mr. Ernest Yerkley, was paying the Avengers as well, implicating him in the conspiracy. Emily, Serenity, and Naomi Aachen infiltrated Yerkley's penthouse to get answers, but were too late; another team of mercenaries, belonging to private contractor company Three Crowns had assassinated him. The three took them by surprise, looked through the building, and found the information they needed. However, they were chased out of the building by an attack chopper and more Three Crowns mercenaries. They narrowly avoided getting caught by the police. The information they found went to one of the gangs and was used against the PMCs in a meeting at a waterside storage facility. Just as Emily, Barbara Day (Emily's girlfriend), and Serenity were about to infiltrate it, the representatives were shot, and the three were discovered. They captured their leader, "Captain Taneo". Serenity teleported him out of there to interrogate, but left Barbara and Emily behind. Before they could escape, a band of capes started attacking the PMCs. One swooped in and took Emily. She shot him in the leg and was dropped onto a container. She broke her leg on impact. Two other capes were waiting. They threw Emily into the ocean, but Barbara saved her and brought her to shore elsewhere. "I got my marching orders, Elle. I'm part of the New War Initiative now." -- Emily, on her conscription into the heroism league. On September 1, 2014, the American government began conscripting people from the lists in the Department of Registered Combat. Emily, who had been registered for her Lead Mantis gun-kata, was one of them. On the 7th, they publicly announced they had a sizable league of heroes to fill in for the sudden shortage of capes, as most of them began to work for Three Crowns. Emily was sent off to The Farm, an old, non-disclosed training ground for heroes. She returned weeks later, under the guise of "Tombstone", the leader of one of the N.W Squads. After several successful PR stunts, the squad's first mission was to stop a bank heist. One of her dry cleaning clients, a telepathic villain known as "The Persuasion", was able to establish a telepathic link with her. A couple of days later, Persuasion kidnapped her and brought her before the League of Malicious Order. She explained she was fighting them against her will and had no choice, as the government had enough information on her escapades to not only get her fired from the NSU for compromising the union's policies (which would turn her into a target by all her clients) but could also be arrested on charges of vigilantism in regards to investigating her father's death. "YOUR REWARD WAITS AT THE END OF THE BEGINNING." -- The Reaper. After a heated argument with Barbara, Emily went to the East Waterfront to clear her head. After feeling like she was struck by something, she returned home with a fever. It soon developed into an unknown sickness: Emily's eyes turned from light green to a sickly yellowy-green; she became paranoid and emotional from almost anything; and she started what she thought was hallucinating about a Reaper Silhouette following her everywhere. However, the silhouette made itself manifest in front of her friends as they came to check up on her. One of Emily's psionic friends, Elle, attempted to enter her mind to discern the problem, but was told by the silhouette that something was coming to kill her. Elle was shown an image of a destroyed building by the Reaper. Further investigation from David Becker and Harley Harrison yielded no results. David, Elle, and Harley went to the location and were attacked by zombies, infected with dark energies. The energies were released from their host and created a flesh golem. When it was killed, it spewed its energies into the city, infecting more people. A day later, Emily was drawn to a shanty town in Westside, and went to go investigate. Chris Tallaghan phoned David and asked for him to find her. Emily was paranoid of David, trying to keep her distance while justifying her investigation. They disturbed the infected living there and fought them off. Then they discovered that the infected had been writing in an old, forbidden language, known as "Blood Tongue", which Emily could now translate. She read the infected's plans to destroy Ueseger's Ward, a gem the Mystics of Millenium City thought had been inert for centuries. It was around this time she had conveniently become immune to all magic (as opposed to her Redmond's flaring up and killing her (see below)). After meeting with Mystic Eldrino Eitritus, they discovered that the last known location was at an old ritual circle, hidden in Canada. Barbara, David, Emily, and detective Hoot Calhoun flew over and began investigating the forest. Part way through their investigation, Emily vanished. The group had to deal with a horde of infected, becoming stronger every time the group killed one, until their energies were contained in two giant monstrosities. The group fled to an opening in the forest, where an unconscious Emily was standing over the gem, now active. Before the group could take it with them, The Reaper appeared and pushed them away before vanishing with the gem. It left them with the words "YOUR REWARD WAITS AT THE END OF THE BEGINNING" in their heads. They unmasked Emily and found she was bleeding from her mouth. Back home, Emily and David were comparing notes. However, several she didn't remember writing in Blood Tongue were present, stating that she will die at the forest. She tried to speak it in the language, but began to bleed from her mouth. She remembered that the language was forbidden and that by the speaker would have to sacrifice something to say it out loud. From those notes, they realized that the Reaper and the infected were at war, and that she might have, not only spoken the language to bring the gem to life, but brought about her own eventual death as a result of it. Emily spoke to Eitritus again, who said the second-known location of Ueseger's Ward was a camping site outside of town. She decided to investigate it along with David. They met a robot investigating the string of infections, but at that moment, the infection broke out. The grounds had been supercharged with magical amplification spells, making the infectious energies far more potent, enough to create a large monstrosity that siphoned the infected's life energies into itself. The three holed up in what was dubbed "patient zero's" cabin, and found an underground tunnel leading to another ritual site. They found a possessed man killing more infected and pooling their energies to release onto the city. They killed him, and the energies released and made the infected present at the campsite more powerful. Before they were overwhelmed, the Reaper re-appeared and pushed them out of the ritual chambers in a bid to escape. Emily and David went to go see Eitritus again, who lead them to the secret chambers of a former Servant of the Elder Gods. He told them that the infection was a plague created by the Old Ones to punish their servants for betraying them. It had supposedly died years ago, but was brought back to their time through a rupture in time. The Servant then told them that Blood Tongue was the closest tool to mankind ever speaking the language of existance, and because Emily was the only person who could understand and speak it clearly, she was the closest connection to the Old Ones. In essence, she had become an "Old One" herself. With practice, Emily soon learnt how to manipulate the runes to her bidding. She, David and Barbara returned to the camping grounds to find a large infected monstrosity had formed, using dark magic to create tentacles made out of the decaying limbs of the dead. The three were able to kill it by destroying its tentacles, then giving Emily enough time to carve the Blood Tongue runes into the creature to rip it in half with the power of her mind. Over time, Emily adapted to her new abilities. She and David went to ask The Servant for guidance on using her new powers, but found he was getting put into Ueseger's Ward by The Reaper, before getting taken away. Without him, Emily decided to end the prophecy as soon as possible, bringing David and Barbara with her to find the abomination in the Canadian forests. On arrival, the Reaper granted Emily the power to read Blood Tongue wherever she looked. However, as predicted, she died just when they found the monster. Barbara and David fought it alongside the Reaper, eventually killing it. On its death, the Reaper revealed she was Emily all along. At home, Emily revealed that she had created the prophecy to kill herself as a means to start the events. She died an "unnatural death" because she was infected with the plague and found herself in limbo. She threatened to break existance with her new powers, and struck a deal with the Grim Reaper: deal with the plague how the Grim Reaper wants; and she gets her life back. "There's something strange afoot, isn't there? I mean, aside from the night sky." "Yes. There is." -- David and Emily. "When you have eliminated the impossible, whatever remains, must be the truth, however improbable." -- Paraphrased summarisation of Sherlockian Theory. Car-Fu: Emily knows how to balance, position, and fight on top of moving vehicles, such as cars and bikes. This includes combat (close quarters and ranged) and repositioning ontop cars, motorcycles, trucks, and vans. She also knows how to scale across moving vehicles, and can successfully hijack a vehicle should the need arise. Gun-Fu: Emily has a firm understanding and varying masteries of Chinese Gun-Kata, French Bullet Ballet (or Ballet du Duelliste), and Japanese Zen Riflery (or Woojitsu), enough to swap techniques almost instantly in the heat of combat. She has also created a more complex technique, involving three seperate stances and moves from nine acknowledged martial arts techniques. The technique, officially known as "Lead Mantis", while much more complex than the techniques it is based on, offers practitioners the chance to learn all three stances and master either one or all three of them. Gun Training: Emily has licenses for, and can operate, small-arms guns and scoped rifles. Forbidden Knowledge: When Emily contracted the plague of the Old Ones and did not die from it, she was able to tap into their knowledge. Now that she carries their, she can translate and activate forbidden languages such as "Blood Tongue", the tool of mortality. Martial Arts: Emily has spent fifteen years of her life learning different styles of martial arts. These include: Brazilian Capoeira; Ju-Jitsu; Judo; Karate; Northern Chinese "Shandong" Praying Mantis Kung Fu; Muay Thai; Ninjutsu; Thai Kickboxing; and Zui Quan. She has also created a number of take-downs to quickly dispatch foes: The "Tsumibito no shi" (Sinner's Death) has her force her foot into the back of her target's knee, forcing them to kneel; and the "Dokuken" (Poison Fist) is a powerful punch to the stomach that renders the victim violently ill.
She was requested to register her fists as lethal weapons. This was to ensure she could be legally identified and held liable for whatever action she takes against others. Masterful Ratiocination: Emily is able to quickly deduce and identify facts and identities by stringing together ideas and logic to form circumstantial facts. This is done by examining small pieces of evidence and applying contextual logic to the string of identifications. With enough evidence, she has been able to guess hero's and villain's alter egos, and at one stage, a supernatural devil in disguise. Parkour: Emily can easily navigate the city through freestyle parkour. Although free-running is legal in most places in the city, she reserves it for whenever she is running deliveries, as many customers, regardless of legal standing, tend to forget she is coming with their costumes. Sleight of Hand: David Graveland began to teach Emily about the basics of sleight of hand when she was young. She uses the art of illusionary deception for other practical uses, such as keeping her inventory in her coat (flicking things out of her sleeves), and to confuse anyone looking to steal something from her. "I'm not the Emily you think you know." -- Emily, "clashing" with an unknown assassin. Acrobatic: Emily's body is fairly flexible, making her the perfect candidate for a majority of physical activities. Ambidextrous: Emily is capable of using both hands equally. Durable: While not going out of her way to do so, Emily's martial arts training have allowed her to become strong enough to withstand a lot of pain. Anything scaling outside of "acceptable" for a human being, however, is not ideal. Perceptive: Emily is unusually good with picking up on small details in almost anything. "The real challenge of living in a black and white world is how long people can go before the margins are blurred." -- Anonymous. Emily is a utilitarian neutralist. She believes that the best, justifiable outcome benefits all parties is the one that does not permanently benefit any of them. It is distinct from neutrality in that the latter is focused more so on mediation than outcome, while utilitarian neutrality seeks both consideration and a result. For example: a utilitarian neutralist's response to heroes and villains fighting is to maintain a status quo where one party is victorious, but not indefinately. Many scholars note that the philosophy of neutrality allows a space for mediation and tolerance of either party, which places Emily in between the law, yet far enough from it that she is not placed on either scale of bias. However, utilitarian neutrality has been the center of criticism by heroes and villains alike. Many arguments presented claim: that she must have some kind of personal opinion, and that it makes neutrality impossible; that neutrality is a sense of willful ignorance and delusion and that it is a glorified term for apathy toward the law; the code has the potential to make the utilitarian neutralist hinder lawful operations; and that her moral code does not allow bias in the sense that doing something to benefit one side or the other is immoral to her code. "Snipers aren't the glorified assassins you see in films. They are not some pissed off spy with family issues. They are masters of reconnaissance; ones who can make or break an entire army with a few well-placed shots." -- CPT. Maurice Morgan, on teaching Emily about Sniping. Two Custom-Made Luger Pistols: The "Pulp" pistols are based off Luger design, but were made for a Martial Artist in mind: The two pistols are reinforced, boasting upgrades such as metal plates on the bottom of the grips, allowing it to sustain damage should it be brought down on someone in force; however, to compensate for the reinforcement, the guns are somewhat heavier than the original design. Emily's pistols originally belonged to Arleen, until her death in the Qularr invasion. It is unknown how Emily found them again, as at least one of the pair was on Arleen's person on the day of the crisis. Never-the-less, they play an integral part to Emily's Lead Mantis technique. One Scoped Ruger Mini-14 Rifle: There is nothing unusual about Emily's rifle, and she is hardly ever seen with it. In the event of a city-wide crisis, such as encountering rampaging zombies or misfit toys, she has been known to use it much more frequently in self-defense. "How do you DO that?" -- Serenity Summers, on Emily producing items from her longcoat. Black Leather Custom-Tailored Trenchcoat: The coat Emily wears once belonged to Arleen, tailored with the necessities of an action-cop in mind: it is light and accessible; it has two holsters on the inside for each pistol; and it has an intricate storage system (to replace any need for utility belts) that can be sorted through with the wearer's shoulder blades. Gunmetal Grey Reinforced Leather Gloves: Emily's gloves are reinforced to help protect her when she is handling magical items. They are thick enough to protect her skin from the effects the item would otherwise have on them. However, keeping any item close enough to her would still result in organic injury (see Redmond's Disease under Weaknesses). "All warfare is based on deception." - Sun Tzu, The Art of War. Redmond's Disease: Redmond's Disease is a spiritual degenerative disorder in which the user's body cannot project an aura to absorb and break down magical energies. Direct contact with any type of magic often results in the victim's body beginning to break down until the source of magic is removed. The victim will experience neurological and organic breakdowns, such as strong migraines, loss of co-ordination, intense muscle and joint pain stiffness, and tissue degradation. If the symptoms persist, the victim may die as a result. If the victim is in close vicinity of, but not directly in contact with, magic, the effects otherwise induced will be weaker and work slower. The closer the person is with the source, the stronger the symptoms become. Single: Emily is single and not willing to change that. "Emily, stop that! Sorry, she does that a lot. She analyzes everyone." -- Serenity Summers, on Emily deducing someone. Serenity Summers: Serenity is a member of the The New Vanguard supergroup. She is often determined and enthusiastic, quick to act on her sense of good will and moral judgment; this often played against Emily's reserved and thoughtful approach. Nevertheless, the two shared a bond built beyond the initial mutual respect and trust they had for each other. Serenity is one of the only people Emily will make exceptions for, disregarding her own neutrality and morals to defend her from heroes and villains alike. Their initial friendship got off to a shaky start. At first, Serenity was driven by a literal inner-demon, gaining psionic powers from it but losing control over herself. She would often attack and mock other people, including Emily because of her beliefs and goals. Despite this, Serenity was one of the closest people Emily had to a friend, and thus she kept close to her. Emily eventually convinced Serenity to consider removing the demon from her mind, even going so far as to allow herself to be used in its removal. Emily continued to keep an eye on Serenity, helping her reconnect with people and start her life again. The two got closer until eventually Serenity asked Emily out, then moved in with her. They lived together for a year. Eventually, Serenity's psionics began to degrade her mind, deteriorating much like Huntington's Disease. Emily asked Dr. Hamlet Greene to develop a cure, which he worked on for months. However, they broke up two months later. Emily began noticing that other people were flirting with Serenity (while she was returning it), and became steadily jealous of the attention she was getting. Eventually, Serenity told her she had cheated on Emily with another hero. They broke up not long after. "She's an amazing girl, I'm sure you of all people could agree with me on that." -- Detective Barbara Day, talking to Serenity Summers about Emily. Barbara Day: Barbara Day is a detective/forensics officer with the MCPD. She can see the lives of a dead person through contact. She and Emily met through the dry cleaner and started dating, months after meeting for the first time. However, they slowly began to drift apart, and seperated. Arleen "The Tombstone" Morgan: (Born 1962, Died 2009) Arleen became Millenium City's first African-American action-cop in 2004. As her mother, Arleen did all she could to protect Emily from the troubles of living in the city, including the dangers Redmond's and carrying her work with her. As her idol, Arleen often inspired Emily to shape her life around Arleen's. She taught Emily how to ratiocinate, and some martial arts techniques, including how to apply the "Form of the Tempest" to techniques. Arleen had always been on first response on both of Emily's kidnappings, and was always fiercely protective of her daughter. When Emily was accused of murder, Arleen quickly dispelled accusations by providing legal and logical evidence that Emily could not have fulfilled the criteria of the crime scene, as she has no mutations to speak of. Emily still looks to Arleen's life for guidance, despite her death. Her utilitarian neutralism stems from Arleen's heroic duty to "reclaim justice in the face of doubt", although not as radical as Arleen's approach to a moral code; while her passion of the martial arts comes from the clarity it provided her while she trained with Arleen. Molly Morgan: (Born 1945) Molly Morgan was Arleen's sister and Emily's aunt. She served as an UNTIL field doctor from 1966 - 1992. She is also the mother of Tate and Guy Morgan, and wife of Captain Maurice Morgan. Althought she did not play a significant role in Emily's life until 2009, the two are both very respectful of each other, with Molly even seeing Emily as one of her own daughters. When Arleen died, Molly helped to financially support David and Emily until they could support themselves. When Emily eventually moved out, she helped pay for several fees, such as accomodations and medical payments. Emily still thanks Molly for helping her become independent, believing that her debt to her will never be repaid in full. CPT. Maurice Morgan: (Born 1940) Captain Maurice Morgan is the husband of Molly Morgan, father of Guy and Tate Morgan, and Emily's uncle. He joined with UNTIL in 1960, eventually achieving the rank to Captain in 1964. He was moved to one of UNTIL's Commando Squads in 1964, where he was made a designated marksman. On Green Monday, 1966, Maurice was part of a two-man sniper team, but was shot in the spine and was honorably discharged after his service. To Emily, Maurice is her preferred father figure. He taught her how to operate a rifle, and gave her tips on how to use it (in tandem with her actual training). He can appear cold at times, but has a soft spot for family and friends, especially Emily and Serenity, the latter of whom paid for surgery to restore function to the lower half of his body. Tate Morgan: (Born 1992) Tate is the son of Maurice and Molly, and Emily's cousin. After his graduation, he became a vigilante with the Westside Avengers, unable to find work elsewhere. However, when the gang covered up a crime by claiming Emily and his family were responsible, he quit. Tate's testimony in court was enough to get the leader and half of the gang arrested. Tate has always been like a big brother to Emily, defending her in school and on the streets. The two have a close bond, with him acting as her personal confidant when needed. Guy Morgan: (Born 1995) Guy is Tate's younger brother and Emily's cousin. He often sees himself as a hardened gangster, although many of his antics always end in embarrassment. Secretly, he wants to follow Tate's footsteps and become a well-known defender of the streets. Emily and Guy do not really get along well, with her disliking his irrational actions and naive attitude, but she has defended him on more than one occassion from would-be enemies and people looking to exploit him for whatever reason. David Graveland: (Born 1960, Died 2014) David was an actor before he met Arleen, but became famous as a non-magic illusionist. Although the idea was novel, it was more than enough to set him and his family up well enough. However, after Arleen's death, he sunk into a depression. He disappeared from the spotlight and became an alcoholic, unable to cope with his loss. Emily used to harbour respect for him as a loving father. He became abusive towards her, yet she had to find a job to support the both of them. One night, he found out how to get into her bank account, and used it to buy liquor. She moved out a week later to live with Arleen's side of the family. He was murdered in February, 2014. Albert "The Burn" Bunsen: (Born 1986) Albert's powers first materialized at the age of twenty, when he set his blinds on fire simply by touching them. He had not registered his powers until three years later, after he almost set a puddle of petrol on fire at a gas station. He began seeking help to control his powers. The government put him on the New War Initiative by blackmailing him with that same information. Trent "The Quick-Fix" Clarity: (Born 1989) Known for his medical genius, Trent signed up with the department of registered combat when he found he had literal healing hands; he was on the site of a car crash and brought a dead woman back to life while checking for a pulse. He volunteered to join Cemetary squad, looking to assist more people as a superhero. Le "The Voice" Do (Born 1992) Hiding his real talents of technopathy, Le works as an IT specialist for a law firm in Downtown Millenium. He busies himself with the problems of others (or more specifically, their machines) and sometimes improves on existing products. He had signed up with the Department of Registered Combat, hoping to study and teach what he knows to engineers working with the government. He was put into Cemetary Squad for the same prowess he tried to hide. Zia "The Iron" Jorgannha (Born 1994) Zia had not discovered her super strength until she watched her parents plummet off a cliff and into a river, trapped in their car. She spent days lost in the wilderness, killing to survive. She was eventually found and put into the care of her neglectful, but rich, aunt. At least, this was the life she thinks she remembers. She was blackmailed with a story spun to make it look like she murdered her parents as a child, and drafted into Cemetary Squad. Robin "Metal Raven" Fenix: Emily and Robin have been good friends for years. Matthew "The Persuasion" Catino: (Born 1990) Matthew came into the villainous limelight after his telepathic powers caused the brain hemorrhage of his abusive mother. When his father found her dead, with his only son standing over her, he had him arrested and sent away. In juvenile hall, he met kids just like him. Instead of reforming, he proceeded to use his telepathy to escape. He then went on to form the League of Malicious Intent, picking the people who believed they had been wronged by the society they grew up in. Samantha "Queen Arachna" Levies: (Born 1996) Samantha's fascination with wildlife one day led her astray from a hiking trip, where she became lost for three days. When she was found, doctors found she had been bitten by a rare breed of spider and had been slowly mutating since. She was taken out of society and put in isolation. By the time she was thirteen, she had developed the lower body of the spider she was bitten by. Eventually, she became sick of isolation, and broke free by webbing her captors. Tired of a society that chooses to hide its monsters, she became "Queen Arachna", and began terrorizing the populace. Sara "Dr. 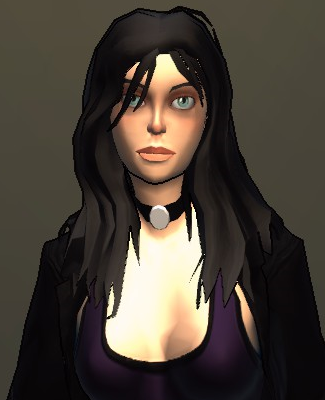 Twilight" Bufley: (Born 1994) As a child, Sara showed astounding and potentially limitless levels of logic, enough to have her relocated to the now-privatized Vibora Superhero Academy. The American government began to put her on their lists, eventually conscripting her into their services as an analyst. She was only 12 by then. Yearning for a life to call her own, she broke free and went into hiding. Ever since then, the government has been looking to reclaim whom they assume is their property: "Dr. Twilight", a master of engineering and strategy. "The Sydney Hitman" (Born ????) Not much is known about Sydney. He chooses to emulate his persona, believing it is "who he is" now. Recent rumours have surfaced that he was once part of a government experiment to create a super soldier commander. He uses his massive arsenal of guns and swords to overcome anyone who stands between him and his contracts. "The Grid": (Born ????) A presence heard throughout the rise of technology, The Grid is responsible for some of the world's major failures in technology. Some even say he was responsible for the Y2K bug, and would have succeeded if not for some unsung heroes. Now the handler for the League, The Grid is cited as one of the most feared names in modern day society for his cunning and merciless approach to fighting the law - at least, in the digital world. Many criminal specialists speculate if The Grid is even human. Or real, for that matter. Dr. Hamlet Greene: (Born 1980) Hamlet was a brilliant scientist working with UNTIL's R&D team, developing several breakthroughs for their superpowered soldiers. His most notable development was the stabilization of minor psionic powers and psychic links. Outside of the labs, he had a wife, Katherine, and a son, Earnshaw. His best friend was a cape named Trent "Captain Justice" Reynaldson and his son-turned-sidekick Damian "Kidd Six". During the Qularr invasion, Hamlet was tasked with medical duty in East Millenium. During his service, he was deployed to another part of the city to treat victims, and saw Earnshaw and Katherine, who were mortally wounded from being trapped under burning wreckage, and Damian, who was badly injured, on the list of victims. Unable to waste what resources he had on too-far-gone survivors, he had to forsake treatment for his own family to save Damian. A month after returning to duty, Hamlet's colleagues reported that his experiments on members of "Project: Supercharged" (a project to enhance the powers of the superpowered soldiers) were injuring the test subjects physically and mentally. He was discharged, and he disappeared for a time. He eventually re-emerged as a villainous scientist seeking revenge against Trent and Damian, for indirectly killing his family, and UNTIL, for turning him into a disgrace to the science community. Hamlet was one of the few people who reported seeing Emily "save" people from the alien invaders. Emily has a deep respect for the man, going so far as to ask him to help her former girlfriend's psionic Huntington's Disease. He believes Emily can save him from the life he created for himself. Benjamin Kyunichi: (Born 1993) Benjamin is the waiter and owner of the White Dragon, a restaurant Emily frequents. He is very playful and charming, often roping Emily into improvising scenes with the theatrical entertainment. He was also once part of the Red Banner, a life he has desperately tried to escape, and has. He uses a katana, much to his own chagrin of "stereotyping himself as an Asian gangster". Benjamin is also one of the few people who has reported seeing Emily during the Qulaar Invasion, claiming she saved him and "Bo" from their old restaurant collapsing on them. Chloe Tallaghan: (Born 2006) Chloe was born to (now ex) Cobra Lord driver Chris Tallaghan and witch villainess Esmerelda Thorngrass. Although still new to the world, she is destined for greatness; during dinner with Chris and Emily, she sneezed a plant pod onto the table, where it flowered into a white lily. Emily is Chloe's god-mother, and does all she can to protect her. Although her powers may hurt or nearly kill Emily (due to the dry cleaner's Redmond's Disease), Emily none-the-less stays with her. Chris Tallaghan: (Born 1984) Chris is the father of Chloe Tallaghan and another friend of Emily. He used to run with the Cobra Lords before a botched attack on a rival's business nearly landed him in jail. He has since quit the gang and now offers Car-Fu lessons. He keeps a revolver close, in case anyone threatens him or his family. Emily's unintended involvement with his departure from the Cobras has put her in high esteem. She had saved his life more than once from the Cobras, and has convinced them to leave the Tallaghans alone. Henry "Bo" Ksang: (Born 1990) Bo is a simple-minded waiter for the White Dragon and long-time friend of Benjamin. Like him, he was part of the Red Banner, working as an enforcer. However, he too has quit the gang for a more peaceful life. Bo has also reported seeing Emily during the Qulaar Invasion, claiming she saved him and Benjamin from their old restaurant collapsing on them. Mordegon, Servant of the White Dawn: Not much is known about Mordegon, before he became a servant of the Old Ones. It is rumoured that he was the first betrayer of the Old Ones and was cast down by the plague for his defiance. However, as the infected of the plague do not die a "conventional" death, Mordegon would have spent years serving his new masters in death. Emily found him, deep in the depths of an arcane library, while she was searching for clues about the plague she was inflicted with. The Reaper bound his essence to Emily's life force through Ueseger's Ward, thus putting him into her service. He now acts as her advisor and guardian. "Kingmaker": A political assassin first from the Silk Rope Hangmen timeline (see "Alternate Universes"), the man known as Kingmaker made his first appearance in Millenium City in an attempt to escape his universe's Emily. When Millenium's Emily was informed her life signature could be detected in another part of the city, she raced over there to investigate, but found the remnants of a previous fight. The evidence lead to her friends investigating and following up on several leads, given by The Detective (who was acting as an ambassador as well as a superhero), and eventually lead to his arrest and return to his original universe. Kingmaker has a minimal, but powerful arsenal. He wears tactical armour to absorb the kick his weapons would have, essentially turning high caliber weapons into practical close range weapons. His scoped STR (Stormlancer Tactical Rifle) is a high caliber sniper's rifle, and can nail a target nearly half-way across a city district. When he's seen in action, he uses that in tandem with his Desert Eagle and Combat Knife. He also commands the "Murksleep Mercenaries", a highly skilled team of assassins capable of eliminating (or at the very least pacifying) superpowered capes and masks. Detective and Other Law Enforcement: While Emily might not be widely acknowledged as a detective in any regard, one might have heard that she doesn't hesitate to deduce something, or that her mother was a famous action-cop. Martial Artist: Emily has learnt, practiced, taught, and mastered different kinds of martial art techniques, as well as created the Lead Mantis technique. Her fists are also registered as lethal weapons, putting her on some government lists. Redmond's Disease Survivor: Not many people have such a violent reaction to magic as a Redmond's survivor does and live into their twenties, making the disease very rare. Your Dry Cleaner. Probably: Whether a hero or a villain, an officer of the law or a mook, Emily will make sure your costume is cleaned and ready for your next battle! Cross-Genre Character: Emily draws on expectations from both the crime and superhero archetypes. She's a ratiocinative gothic detective, discovering clues through solidifying circumstantial evidence as hard fact (Gothic Crime Fiction). She's slow to trust others, but fast with her wits, and keeps her guns close (Hardboiled Detective Fiction). She's also a parody of the anti-hero archetype, popularised by the "Dark Age" of comics: her costume mimics the dark aesthetics of the times; her mission is hardly heroic (to get the dry cleaning done); and her "powers" revolve around the awesome visuals of her Lead Mantis Gun Kata. The Silk Rope Hangmen: Emily's father was murdered a year after her graduation. With the only detective willing to take on the case - an alien jailer masquerading as a Golden Age noir fiction detective ("The Detective") - she became a masked vigilante to further her investigation. The investigation lead them through an underground war of business espionage and blackmail. Eventually, alongside a Silver Age speedster ("The Outbacker"), and a Bronze Age empath ("Strongheart"), they created the "Chevron City Guardsmen". The Cemetery Empire: 2010. Earth's government submits to the Isirions - an alien empire spanning a large expanse of the universe. Those who resisted were either branded as traitors and killed, or became part of a growing underground resistance. Lieutenant Emily "P.01021994" Graveland helped conquer the Isirion jailers and freed earth. She has since become a high ranking officer in the New World's United Hero Defense Force. The Prince Spider's Web: An alternate universe to the Silk Rope Hangmen. Without the help of what would be seen as the Chevron City Guardsmen, Emily braved the investigation into her father's death alone. Unable to stop herself spiralling into a web of deceit and conspiracies, she became the thing she was trying to fight: a dangerous killer. Emily: "I'm your dry-cleaner. Probably." Emily: "Barbara? David? Let's go face the end of the world." -- on facing the abomination in The Forbidden Language. Emily: "Your interactions with us, just now, reserved but not without a hint of contained excitement, suggests that at some point in your life you had an issue with the wrong kinds of people, and now you have a difficulty of trusting people. You contain yourself because there is someone here who is holding you down? A mage, maybe? Someone who has access to magic. Your self-degradation is not limited to trying to hold yourself back, implying you were not always a dog. Now, judging by your coat, and your strong accent, I would assume this occurence happened sometime around the 1800's, which would explain your coat and your cravat, and the fact you may not have been a dog for all your life. You were... a Scottish scholar of the arcane arts, but were punished at some point, and this is what you became." Dregs (Mouthing): "What the f***?" Dregs: "Jist... jist who are yoo, lass...?!" Emily: "I'm your dry cleaner. Probably." Dregs: "Whit? N-naw, I... C'mon noo, yer no jist a dry cleaner, dry cleaners aren't aw' gothic lookin' Sherlock Holmes, I... How. I mean, jist. Ye'... whit ye' said, that cud be right. Maybe." This page was last modified on 12 December 2014, at 09:56. This page has been accessed 75,898 times.